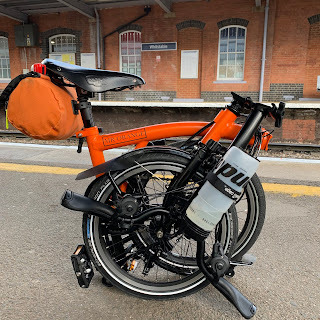 My Orange Brompton: Top 10 tips for coping after the Brompton World Championships! Top 10 tips for coping after the Brompton World Championships! The Brompton World Championships is THE premier cycling event bar none. The recent 2015 event, still fresh in my memory was quite simply brilliant. The location, fast paced circuit and the fact it was the 10th anniversary all worked their magic in making it a very special occasion. However, the intense highs are invariably followed by some lows, especially when BWC 2016 is a year away! Continue reading for some tips on how to cope in the wilderness that is waiting for the next Brompton World Championships. (I may well be speaking about the BWC here in the UK but what I offer below is applicable to anyone who had competed in any of the BWC's around the globe). It might well be but dispel all negative thoughts from your mind. Do not listen to any little voices inside your head offering a negative vibe. You must remain upbeat at all times even though the BWC seems so long away. Mental toughness is needed but you can do it. It is vital that during the long winter months you practice the unfold! It must be done again and again...and then again for good measure. You and your Brompton must almost become one, where the fluidity of your movements are so natural you do not have to think...you simply do! Get your other half, your children, parents, friends or work colleagues to time you. You need to get the unfold done in under 10 seconds. Anything more and you will need to practice. It will be hard, but you can do it! It is going to be some time until the next BWC and if you are not careful you might lose that fighting spirit. To maintain your almost coiled spring-like state, get close family members / friends to periodically say 'Eye of the Tiger' at you. This loaded statement will provide you with a reminder of the racing you have done and what is to come in the future. #4 Training - You are an international world class athlete after all!! I do not feel I did any specific training for BWC 2015 and certainly need to do more in the next 12 months. Having participated in the Brompton World Championships you are now an international world class athlete and as such you need a training regime. Of course this is going to involve #3 but you will need to start now and not leave it too late. For me this is going to mean more circuits of Richmond Park and upping my overall millage. Your Brompton needs to be used as often as possible. Riding a Brompton will make you happier, fitter, save you money on commuting costs and allow you to obtain a greener carbon footprint. Riding a Brompton on your commute, to the local shops for some supplies or just going out on an adventure will all help. #6 Where did it all go wrong?! Only if you look objectively can you improve next time. If you cannot wait the full 12 months until the next BWC wherever that is for you, why not attend one of the BWC taking place around the world?! It might be an excellent opportunity to test out the things you put right (#6). In the long wait for the next BWC you will need something totally removed from Brompton and racing. What you need is a television series that you can follow in the times when you are not thinking of the BWC or ways to improve your performance. For me it is going to be BBC's 'The Great British Bake Off.' Of course this will have a limited run and not last a year so when this programme finishes, I will turn to 'Game of Thrones.' Make sure you do choose something as you will need something else to occupy your mind in addition to thought of the BWC. A little time spent thinking about how you could make your commuter hack more race ready might just be the edge you need. Your commute is important. I do not want you to do anything that is illegal, against the highway code, dangerous or ungainly. You must remain a gentleman / lady at all times...standards! What I propose is that should you see a roadie or any other cyclist for that matter on your commute, as long as you can do so safely, chase them down! Overtake them! Get those legs turning and pass them as swiftly as you dare. While doing this have #3 in you mind! There you have it. Ten top tips for coping with the aftermath of the Brompton World Championships. Let me know how you get on as I and the rest of you reading would surely love to hear about your efforts. As for me, the training for BWC 2016 stars now!